A trip to Asia is one that promises beauty, intrigue, a friendly culture, mouth-watering cuisine, jaw-dropping architecture, and unique experiences. As far as destinations go, while there are many hot spots for tourists, Thailand is typically one of the most popular vacation spots. Many will flock to the beach area of Phuket, but for those looking for a more laid-back and intriguing experience, then a visit to Chiang Mai may be better suited to them. Chiang Mai is located within the mountains of northern Thailand which means the natural beauty of the land helps to add to the allure and mystery. Tourists will be able to explore countless temples, culture, shopping, and animal wildlife. With that said, here’s a look at some of the more unique and spectacular experiences you’ll want to enjoy while in Chiang Mai. 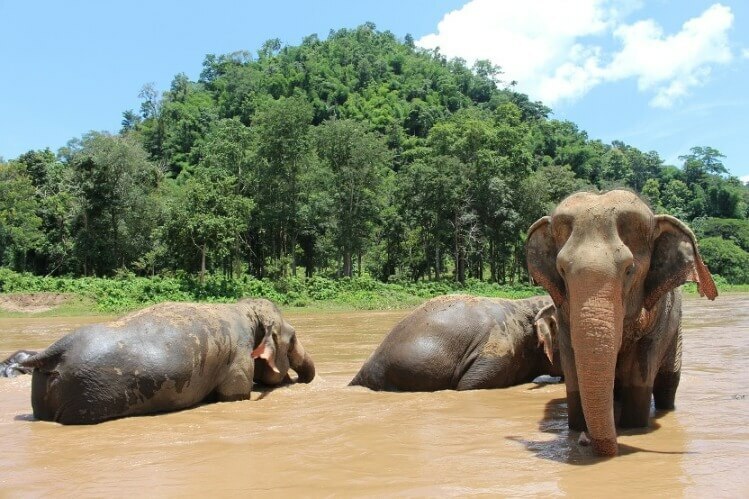 Yes, you read that title correctly, an actual elephant mud bath that you can give the majestic creatures at The Elephant Jungle Sanctuary in Chiang Mai. There is no better way to get up close and personal with these gentle giants with a once-in-a-lifetime type of experience. Elephants crave being clean and it’s also a great way to help protect their skin and help to keep them healthy. So, not only will you be enjoying a fabulous experience, you’ll be doing something good for the elephant. For many tourists, visiting Thailand a huge part of the allure is the fact the country has so many incredible ruins and architecture still standing. The Wat Chedi Luang Temple was built back in 1401, but it sustained damaged in 1545 due to an earthquake. The damage didn’t detract from the beauty of the building though and is a must-see temple for tourists. For those who call themselves a foodie, the Chiang Mai Gate Market is an absolute must-visit. This particular market is known for having the “best street food” in all of Chiang Mai. You’ll find all the local dishes well represented here and it is open seven nights a week. While the hustle and bustle of Chiang Mai can be exciting and fun, you may also be wanting a little break from it all. This is when a visit to Doi Inthanon National Park is ideal. This is actually the highest peak in the entire country. It is 8,415 feet above sea level, providing tourists with a spectacular view of the land. Not only is it beautiful it is also home to more than 362 different species of birds and is known as a wildlife sanctuary. A trip to Chiang Mai is one that will prove to be intriguing, beautiful, and inspiring as you explore all of what Northern Thailand has to offer. This is just a very small look at the many tourist experiences that await.